This story was sent to us by Holly's Mum, Leonie, in February 2015. At the 20 week ultrasound they told us “there is something wrong with your baby’s heart”. Nothing quite prepares you for the horrible pit in your stomach you feel when someone tells you those words. Further ultrasounds and amino fluid tests gave the local paediatric cardiologist a clearer picture of our baby’s heart. Our baby had tricuspid atresia, transposition of the greater arteries and a ventricle septal defect. He said she would need about 3 surgeries, finishing with a Fontan. If she got through preschool years she would have a 75% chance of having a fairly normal life. It was a girl and we named her quickly so everyone was aware that she was a real person. We left that meeting feeling dazed but hopeful. The odds were good. We had two gorgeous kids already and God wouldn’t give us anything we couldn’t handle…….right? Birth day was approaching. The cardiologist said we could have her at the private hospital but with a paediatrician at the birth. The NETS team had other ideas so we travelled to Randwick on the 25th January, 2003 (about 5 days before she was due). My waters had broken but the contractions didn’t start for a few hours. On arrival and with every change of shift a team of specialists would tell me…. "when your baby is born we will…" This was quite confronting and I’m sure it delayed her arrival. At about 11 am on the 26th January, Holly entered the world naturally, mostly delivered by her dad with no specialists around (she birthed quickly at the end). She was pink and beautiful and did not need to be whisked away quickly. She was assessed by the specialist team, given back to me for a breast feed and then taken to the special care nursery to be monitored. All going well; she was transferred to the private hospital closer to our home to be monitored for a few days. We took her home for a week and then returned to the Sydney Children’s Hospital at Randwick for a pulmonary banding, by Dr Nunn, at 2 weeks of age. This would constrict the flow to her lungs to ensure her respiratory system would remain ‘low pressure’. This was necessary for a Fontan to be performed later. At 21 months she went back to the hospital for her bi-directional Glenn, again with Dr Nunn. Her cardiologist decided prior to the surgery that Holly had another rare aspect of her heart; it was double outlet left ventricle. This enabled Holly to wait for her Fontan surgery as she still had blood flowing to her lungs and the alveoli in the lungs grow until you are 8. Surgery went well until about two weeks later when she didn’t seem quite right. We took her back for x-rays and fluid had built up around her heart and chest. She was transported via ambulance to Randwick for surgery in a couple of days to drain the fluid. The following morning it was feared she was deteriorating so the cardiac team performed the surgery to insert drains. I was told by the anaesthetist that she might not survive the surgery but ‘they had drugs ready to revive her should anything happen’….and they were going to do it now! My husband was 1.5 hours away! I would have to do this on my own! Could I do it? Could I be strong? I had to, for Holly. I asked everyone I knew to pray for her, wherever they were. I took myself to the fairy garden, willing the universe to send healing angels to help the doctors and Holly. I returned to the waiting room knowing we had all done the best we could…….and the surgery went fine with no hiccups. Holly had chylothorax. The lymphatic system didn’t respond well to the Glenn surgery. The excess fluid in her body was chyle. It builds up when you have fat in your diet. Normally the lymphatic system deals with fat but when it is damaged, it can’t. I had to stop breastfeeding Holly immediately and she had to be on a 99% fat free diet for 3 months, with gradual increase of fat after that. It is hoped that the body repairs itself during that time and she can resume normal eating. Luckily for us that was the case. Holly crawled and walked normally but when she was about 4 she started developing spasticity in her legs. It took the paediatrician over twelve months to organise an MRI for Holly. She needed a specialist anaesthetist because of her heart. The paediatrician thought it was a blood clot in the brain from previous surgery but the osteopath wanted her spine scanned too. So we did both. Neurologists weren’t sure what was wrong but they knew it wasn’t in the brain. They suspected a tethered spinal cord. She had (exploratory) surgery at age 5. They divided up the fibrous tissue below the spinal cord and it retracted a centimetre straight away. Her spinal cord finished a vertebrae lower than ours and as she grew it tethered like a tight elastic band, pulling on the nerves of her lower legs. She had to lay still and horizontal for 72 hours so the spinal fluid didn’t leak out of the incision. She lost a lot of the spastic reflexes after the surgery but they couldn’t undo some of the damage that had been done from leaving it so long. We joined The Children’s Hospital at Westmead’s disability clinic for plastering of her legs, AFO’s etc. She hardly complained. She was such a trooper. Her pain threshold was very high. Holly spent much of her time as a pre-schooler in a pram or carried on shoulders or in our arms. She would get too tired to walk too far. We didn’t know if this was due to her heart or her legs. Her oxygen saturations were about 85%. She was dusky blue on her lips and nail beds. She had clubbing of the fingers and was very thin. She liked to eat but it didn’t seem to put on any weight. Other than that she seemed pretty normal. The school put in a lift so she could access the different levels at the school. They pushed her in a stroller on excursions. It was a small, nurturing school and we didn’t hide Holly’s disabilities. We embraced them and so did others around us although she wasn’t really invited for play dates with her peers. As Holly approached her 8th birthday her oxygen saturation levels started to fall. She was very tired and I don’t think she was learning much at school. She was due for her Fontan procedure at the beginning of February. Her oxygen saturations were 72%. We quarantined the whole family for 4 weeks so she would be well for the procedure. They cancelled the first one due to more urgent cases. That was devastating but there must have been more CHD babies needier than her. Finally she had her Fontan 2 weeks later. Dr Winlaw was her surgeon. The operation was shorter than we anticipated. He said the surgery went very well and was “very enjoyable”. He did prepare us that she could be in hospital for about a month in light of her previous heart surgery and the lymphatic complications. We prepared her siblings, who were now 10 and 12. They were very aware of the situation and both handled it very differently. The 12 year old boy worked on ‘denial’ and ‘blocking it out’. He didn’t want to visit her in hospital. Her 10 year old sister didn’t want to leave her side! Extended family helped immensely in this difficult time. The time came for Marty and I to see her in ICU. What a sight! She was pink! Pink lips, pink nail beds. Yes, there were lots of tubes and cords attached to her, but she looked so well. Martin asked the nurses if they had painted her with anything to make her so pink! Her oxygen saturations were 95-96%. She showed remarkable recovery and was discharged from hospital after 8 days. She did have chylothorax again so she was on a no fat diet for 3 months. Holly’s love of sport really became evident after her Fontan procedure at age 8. During her home recovery she would spend hours outside shooting balls into a basketball hoop. She was getting stronger every week and becoming more active. We never really knew before if it was her legs or her heart that was tiring her out so much but it became evident that it had been her heart. A month or so after discharge she was feeling incredible pain and regular pain relief wouldn’t help. Early in the hours a few days later I took her back to the emergency department at The Children’s Hospital at Westmead where she was admitted and a myriad of tests were performed. It turned out that her heart was inflamed and rubbing on the chest layer so she was sent home with Nurofen multiple times a day for a couple of weeks. This solved the problem. About 6 months after discharge, Holly was having episodes of feeling quite faint and light headed. She was due for a check-up with her cardiologist, Dr Sherwood, so we brought it up then. It turned out that Holly has a naturally low heart rate like her Dad and with the added new Fontan system the blood had to travel all the way around….at a slower rate. We were advised to increase salts in her diet which worked really well. Staminade powder is really helpful when she has very active days. Holly’s love for sport kept growing and we struggled to find team sports that she could join in with her disabilities. We spoke to the disability clinic at The Children’s Hospital at Westmead at one of the review visits for her legs. 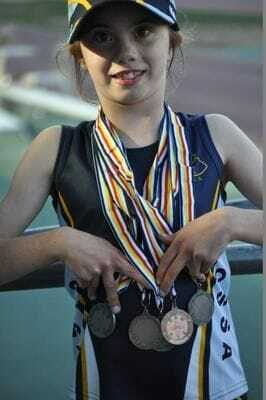 They suggested getting her classified for swimming and athletics so she could compete with other disabled athletes. This was great for Holly but they didn’t recognise her heart problems so she was only classified for the spasticity in her legs. So the competitions began in 2012, coinciding with a change to a new school, NBCS (Northern Beaches Christian School). They really embraced Holly’s differences. She competed at State level for both sports. We learned a lot that year and she grew in confidence. In 2013 she competed in swimming and athletics again at school levels. She wasn’t so keen on swimming at a higher level. The big swimming arenas overwhelmed her a bit and it was harder for her to swim 50m. Her heart really impacted this and it took her quite a while to get to the end. Athletics was short and sweet and didn’t involve any restrictions on her breath by putting her head in the water. She made it to Nationals for athletics (by default) that year in 100m, 200m and shotput. She started coaching with past Olympic champion Jane Jamieson prior to Nationals. In 2014 she had to be reclassified for athletics. They changed her classification because her legs had improved. There were still no classifications for CHD. Holly was really disappointed with this as she wanted other cardiac kids to be able to compete in sport like her. It was also very tough when she saw kids with hearing, sight, autism, transplants for bone marrow and CHD wasn’t recognised. Holly didn’t compete very much in swimming that year. It was tough work and her passion was with athletics now. She was training more now with Jane and improving her times and techniques. 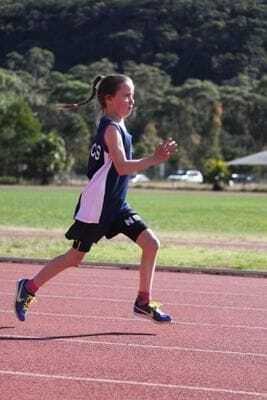 She knew that she would have to win medals at State to get to Nationals and it was going to be in Tasmania…..and I promised that the whole family would go if she got there! She made it through zone, state Christian school, CIS (combined independent schools), broke records in 200m, long jump, shot put and discus; came 1st at State for shotput, discuss and 100m & 2nd for long jump and 200m. At Nationals she received 1st place for 100m, 200m, discus, long jump (broke a record) and 4x100m relay. She came 2nd in shotput. WOW WOW WOW! Huge achievement! It makes me tear up every time I think how far we have come! She will be attending a special award ceremony by CIS next week as she is the para-athlete of the meet.